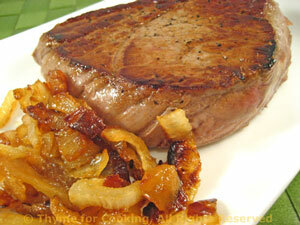 Pan-Seared Steak with Golden Onions, Thyme for Cooking main course. Heat oil in nonstick skillet over medium-low heat. Add onion and sauté until starting to brown, about 15 minutes. Stir in vinegar, mustard and heat through. Remove onions to a plate and cover to keep warm. Quickly cook steaks for 2 - 4 minutes per side depending on type, thickness and personal preference.